The 8th IMBeR China-Japan-Korea (CJK) Symposium was held at the East China Normal University in Shanghai, China last month. The theme was Marine Biogeochemical Sciences for the Sustainability of the West Pacific Biosphere. In addition to participants from China, Japan and Korea, the symposium attracted researchers and students from Thailand, India, Pakistan, Sri Lanka, Malaysia and Canada. Following the symposium, the IMBeR Human Dimensions Working Group held a training course. These meetings are held every second year and the next one will be in Thailand in 2020. 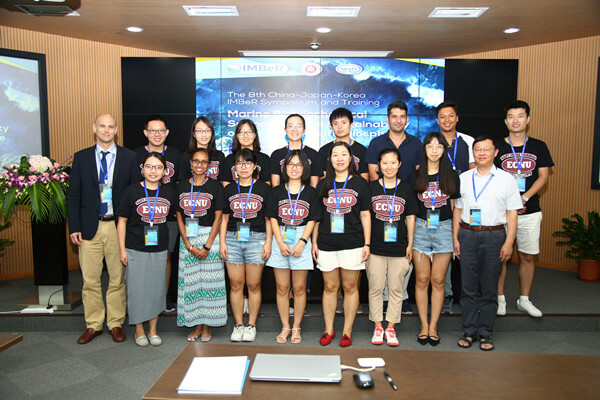 The 8th China-Japan-Korea IMBeR Symposium and Training Course (IMBeR CJK 2018) was held from September 17 to 19 in 2018 at the East China Normal University (ECNU) in Shanghai, China, with the focus on Marine Biogeochemical Sciences for the Sustainability of the West Pacific Biosphere. 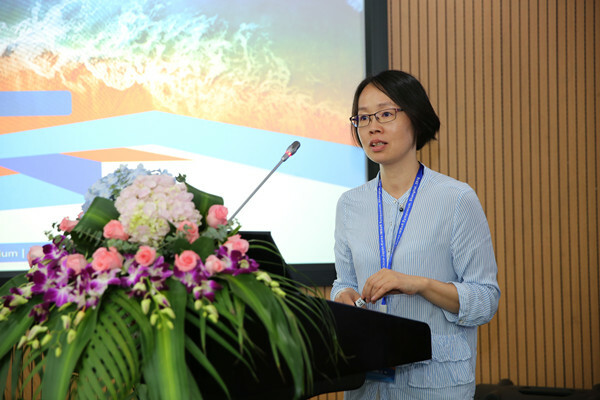 The State Key Laboratory of Estuarine and Coastal Research (SKLEC) & ECNU, China GLOBEC-IMBeR project and IMBeR Regional Project Office co-hosted the event. IMBeR CJK 2018 attracted over 100 delegates including scientists, young researchers and students from almost 30 marine scientific research institutions and universities, which were from China, Japan, Korea, Thailand, India, Pakistan, Sri Lanka, Malaysia and Canada. The IMBeR Human Dimensions Working Group Training Course and IMBeR-Future Earth Coasts Continental Margins Working Group Workshop were held as side events to the IMBeR CJK 2018. The Symposium was opened on behalf of the host institute by the Vice-Chair of SKLEC, Hui Wu. Xiuzhen Li and Subin Wang gave welcoming addresses on behalf of SKLEC and ECNU respectively. Sinjae Yoo from the Korea Institute of Ocean Science and Technology (KIOST) and Hiroaki Saito from the University of Tokyo welcomed everyone on behalf of the IMBeR CJK 2018 Organizing Committee. John Claydon, IMBeR International Project Office Executive Director, provided insight into IMBeR’s aims and the way the project operates, as well as highlighting some of the upcoming IMBeR events such as the second IMBeR Open Science Conference – Future Oceans2 that will be held from 17-21 June 2019, in Brest, France. It was then the turn of Ying Wu, to describe the history of the CJK IMBeR symposia, and to announce that due to popular demand, the geographic range is to be extended - at its next symposium (in Thailand in 2020), it will be the IMBeR West Pacific Symposium. IMBeR CJK 2018 was developed around three sessions that addressed (i): Advances in observation and modelling of physical and biogeochemical processes in the West Pacific region; (ii) The response of marine ecosystems to natural and anthropogenic forcing: past, present and future; (iii) Responses of society to global change in marine systems: ways forward. Keynote speakers from the region presented cutting-edge science regarding the three session themes, in addition to almost 45 oral presentations and over 35 posters. Prizes for their excellent poster presentations were awarded to Xiaolu Wang, Shuo Jiang, Jinlong Dai and Tianning Wu. A Human Dimensions Training Course was in conjunction with the IMBeR CJK 2018, and 50 early career scientists and students participated. 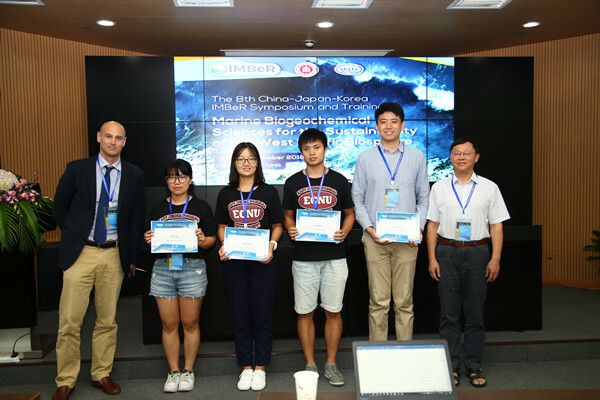 Yinji Li, Mitsutaku Makino, Ling Cao and Gi Hoon Hong kicked off the course by presenting recent IMBeR-related research on the responses of society to global change in marine systems. They also introduced I-ADApT, the integrated management assessment framework developed by the IMBeR Humans Dimensions Working Group. This uses Description, Responses and Appraisal of management strategies that were used in actual case studies to deal with specific issues relating to global change and the effects on the human populations dependent on a marine environment or resources, to develop a Typology. Groups were given the opportunity to present their own case studies on global changes in East Asian marine systems. It to be an excellent learning experience, not only for enabling interactions with interdisciplinary marine researchers who work at the interface of natural and human systems, but also in terms of working together in a very diverse group and the opportunities for collaboration in the future. IMBeR gratefully acknowledges the support provided by the SKLEC for the IMBeR CJK 2018, and the co-funding from the International Exchange Division of ECNU. We also acknowledge the support provided by the China GLOBEC-IMBeR project, IMBeR Japan Committee, Korea Institute of Ocean Science and Technology, Anthropocene Coast and Acta Oceanoiogica Sinica.We are also grateful for ongoing support of the IMBeR- endorsed projects: Living-resource & Ecosystem Dynamics on the Slope of the South China Sea (LEDS), Processes and Approaches of Coastal Ecosystem Carbon Sequestration (PACECS), The Study of Kuroshio Ecosystem Dynamics for Sustainable Fisheries (SKED), Marine Ecosystem Modeling and Forecasting System in the China Seas and Northwestern Pacific (MEMFiS), Mechanisms of Marine Carbon Storage and Coupled Carbon, Nitrogen and Sulphur cycles in response to global change (MCS-CNS).